With the 2015 NBA Playoffs just around the corner, the newly-opened NBA Store in Glorietta 3, Ayala Center, Makati City just made it easier for you to wear your support on your sleeve by availing of personalized NBA jerseys of select teams. These jerseys are made by official NBA provider adidas. 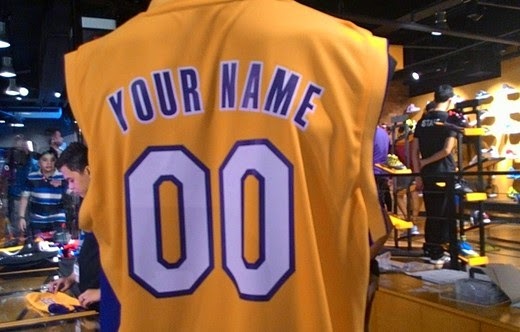 In the Personalize It section of the 1,000-square meter store for basketball fans, you can order and get your personalized replica jerseys in just a few minutes. If you buy on or before May 3, your personalized jersey will come with a free primary logo tee of the same team worth Php 995.00. Among the jerseys available are of popular teams like Boston Celtics, New York Knicks, Chicago Bulls, LA Lakers, Miami Heat, Brooklyn Nets and Oklahoma City Thunder. You can customize these jerseys by choosing a name with a maximum of 13 letters and two numbers to be written on the front and back of the jerseys. The replica jerseys are made of 100% polyester fabric with embroidered adidas logo on the upper-right and embroidered NBA logo on the upper left. The logo, number and name are screen printed. The store also has everything NBA from shoes, socks, t-shirts, bags, caps to limited edition collectibles and autographed memorabilia. The NBA Store is located at Level 1 & 2, Glorietta 3, Ayala Center, Makati City. The store is open daily from 10AM to 9PM on Sunday to Thursday and 10AM to 10PM on Friday and Saturday. For more information, visit NBA Philippines site http://www.ph.nba.com/, Twitter account @NBA_Philippines, and official Facebook page www.facebook.com/philsnba. The NBA is a global sports and media business built around three professional sports leagues: the National Basketball Association, the Women’s National Basketball Association, and the NBA Development League. The league has established a major international presence with offices in 13 markets worldwide, games and programming in 215 countries and territories in 47 languages, and NBA merchandise for sale in more than 125,000 stores in 100 countries on 6 continents. NBA rosters at the start of the 2014-15 season featured a record 101 international players from 37 countries and territories. NBA Digital’s assets include NBA TV, which is available in 60 million U.S. homes, and NBA.com, which recorded 26.9 billion page views during the 2013-14 season, with more than half of all visitors originating from outside of North America. The NBA is the No. 1 professional sports league on social media, with more than 730 million likes and followers globally across all league, team, and player platforms. Through NBA Cares, the league and its teams and players have donated more than $242 million to charity, completed more than 3 million hours of hands-on community service, and created more than 915 places where kids and families can live, learn, or play. International Athletic Trading Company, Inc., (IATC, Inc.) is a joint venture partnership between Ever Fit Holding Company, Inc. and IP Ventures, Inc. Ever Fit Holding Company, Inc. is engaged in retail and wholesale of apparel. Its stakeholders have more than 25 years of experience in retail operations in major malls located in the Philippines. It has 65 retail stores with an average selling floor area of 100 square meters. Over the past five years, it has managed to grow its business at an annual compound growth rate of 6%. The basic strength of its management lies in being able to immediately identify changing market trends and adopt strategies proactively. IP Ventures Inc. is a well-known venture & private equity group in the Philippines with investments in retail, gaming and TMT (tech, media, telecom). Considered as one of the pioneers of the Internet industry, IP Ventures listed the first online games company, and first internet data center company in the country.IP Ventures also owns Netopia with over 60 outlets located in high traffic malls representing over 6,000 sqm of retail space. IP Ventures maintains a joint-venture with Philstar.com to run and operate NBA.com Philippines and has exclusive distribution rights for NBA 2K games. IP Ventures is also launching NBA 2K Online in the Philippines in 2015.